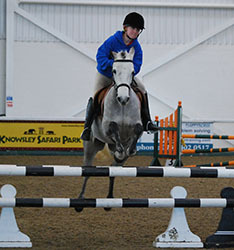 The SPSS sponsored Open Potential Showjumping Pony Championships took place on Saturday 13th November as part of the IPS Auction Weekend at the Aintree International Equestrian Centre, Liverpool. 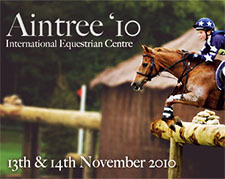 There were 8 ponies entered - no 4 year olds, three 5 year olds and five 6 year olds and all competed. 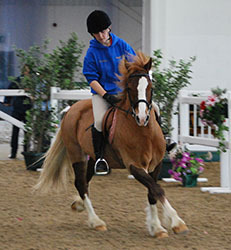 Entry was open to ponies up to and including 148cms (149 cms with shoes) in height and riders could be any age. 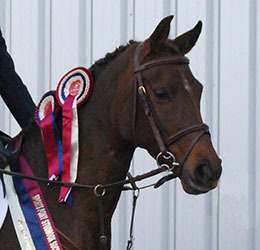 The Overall Champion (pictured on left) was top 6 year old pony, the British-bred Part bred Welsh and Part bred Arab, Larchspur Santa Anita, ridden and owned by Sali Parry and bred by Sonia Whittington-Davis. Reserve Champion was the 2nd placed 6 year old, the Irish bred Connemara, Loughfadda Portduff, ridden by Zac Beasley, owned by Jemma Knox and bred by Stephen Heanue. Morrigan Stud's Morrigan Mahraid won the 5 year old class, ridden by the breeder's daughter Robyn Harris. Click here to read more about these and other prize winners. 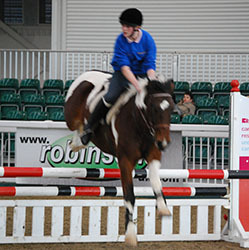 We were delighted to have as judge, Peter Murphy, who is an International Showjumper and Trainer. 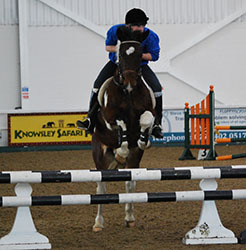 As well being as an accredited BSJA coach, Peter is also one of the British Eventing team coaches and is working with the squad to deliver success at the London 2012 Olympic Games. 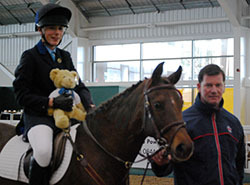 Peter kindly presented the rosettes to the top ponies and is pictured on the right having presented Sali Parry with the SPSS Teddy for the youngest rider. Peter was assisted by BSJA course builder Gillian Milner and the results of the class were determined on a score basis with 4 points being allocated for each of the 7 fences cleared and then Peter allocated marks out of 10 for each of Style, Temperament and Potential to give an overall score out of 58 marks. Reserve Champion, Loughfadda Portduff with rider Zac Beasley, is pictured on the left. Unless otherwise credited, all photographs are by kind permission of Hannah Owen. No pictures may be copied without the permission of the photographer. Overall Champion and Winner of the 6 Year old Class, Larchspur Santa Anita, ridden and owned by Sali Parry and bred by Sonia Whittington-Davis won £25, a SPSS polo shirt and SPSS cap. 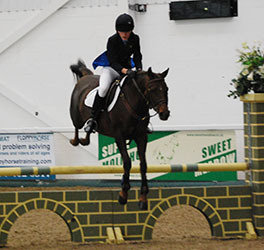 Known as "Rosie", this British-bred Part bred Welsh mare also won the £20 SPSS Voucher for the highest placed mare and Sali (age 12) won the youngest rider prize of a SPSS Teddy! Rosie is registered as both part bred Welsh and part bred Arab as she is 50.88% Arab - primarily from her Arab dam, PHS Dafiinah Alarabi (by So-Black Alarbi), but with a contribution from the traditional British pony breeding of her sire, the Welsh part bred, Brockwell Victor. Rosie was bred by Sonia Whittington-Davis in Inverness. 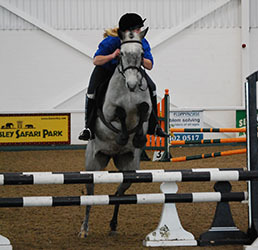 Sali bought Rosie at the 2009 IPS Auction and, despite Rosie only having been recently backed before the sale, Sali and Rosie were back at Aintree for Unaffiliated Jumping soon after the sale and were placed in a class of about 40 ponies! 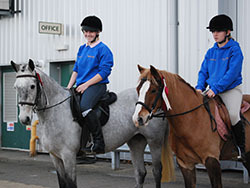 Sali says that Rosie is one of her favourite ponies; Sali and Rosie are pictured on the right. Reserve Champion and 2nd in the 6 year old Class was the Irish bred Connemara, Loughfadda Portduff, ridden by Zac Beasley and owned by Jemma Knox. Known as "Louis", this gelding is classed as a "pony in a million" by his connections as he has an impeccable attitude to work. 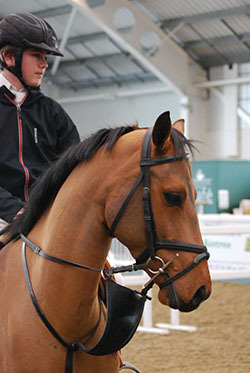 Louis (pictured left) is currently jumping Newcomers although his owner considers him more than ready for Foxhunter classes. 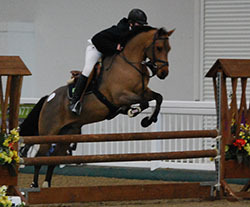 Louis also qualified for Scope 2010 and jumped clear each day with a rider that had only started jumping in April 2010! Louis was bred in Ireland by Stephen Heanue and is by Callowfeenish Mairtin out of Cuckoo Valley Candy (by Mervyn Kingsmill). Louis was one of only a few ponies to sell through the IPS Auction the next day (which was a reflection on the lack of buyers rather than the quality of the ponies in the auction!). 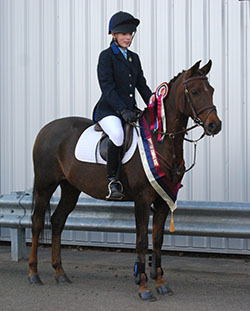 Third in the 6 year old class was 138cm bay gelding, Knockraheen Thibault, ridden by Emma Lawton and pictured on right. Known as "Mr Tibbs", he is another Irish bred Conemmara being bred by Mrs E Bedlycott of Co Wocklow and is by Woodcroft Cognac out of Castle Wood (by Newbridge Oliver). 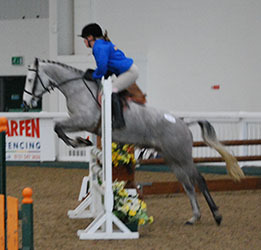 Emma, aged 13 and one month, was very nearly the youngest rider but was beaten to the prize by Sali who was still (just!) 12. Emma has had Mr Tibbs for 18 months and he is her first pony and she finds him well mannered and always wanting to please. 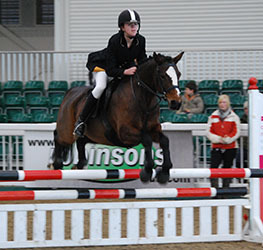 Emma and Mr Tibbs have qualified for the 65cm, 75cm and 85cm Junior SJ classes for Trailblazers 2011 in their first two outings. 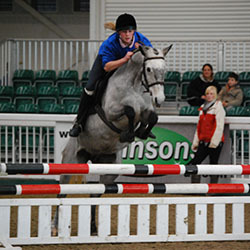 Emma and Mr Tibbs have also excelled in Working Hunter Pony (WHP) classes. 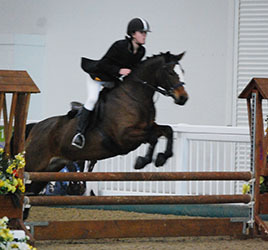 They were placed 1st at the UK Showing Premier Championships 2010 in the 143cm WHP open class on Emma's first attempt at a WHP class. 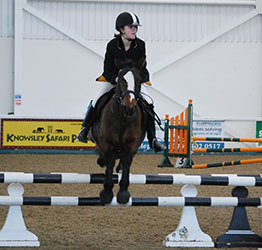 They got an amazing 4th place (out of a class of 22 riders) in the Open WHP 143cm class at the North West Open Championships last month in Rossendale. 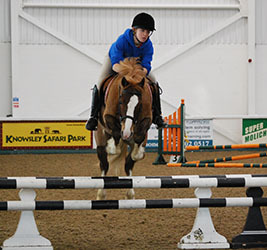 They have also qualified for the BSPS Winter Championships 2011 and Ponies UK Winter Championships 2011 in the WHP Novice and Open classes on the first time of trying. 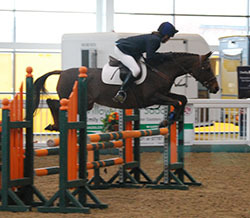 The 5 year old section was won by the British-bred, part bred Connemara mare Morrigan Mahraid ridden by Robyn Harris (pictured left). Mahraid was bred by Robyn's mother, Sally Harris of Morrigan Stud in Anglesey. 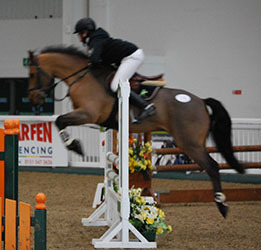 Mahraid is by Kilmullen Fionn (Connemara) out of Morrigan Lucy Too (PB Welsh by Telynau Pavarotti), a mare that competed at BE Intro and Pre-Novice levels. Marhaid had a foal in 2010 so has only recently been back in work but her owner considers her to have a promising future and as an ideal eventer. 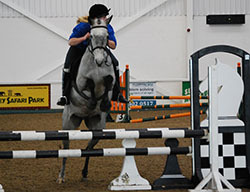 Marhaid's full brother Morrigan Shea was 4th in the 6 year old class ridden by Robyn's sister Abby and he has been competing in British Eventing Intro classes with Robyn and Abby over the last 2 seasons. 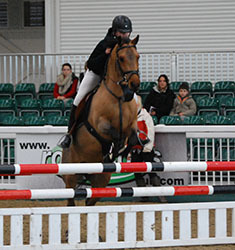 Second in the 5 year old section was the 140cm Welsh Sec D gelding, Talhaearn The General ridden by Abby Harris. The General is by Thorneyside The Governor out of Talhaearn Hevlwen (Talhaearn Orient Express) and was bred by his owner E A Davies. 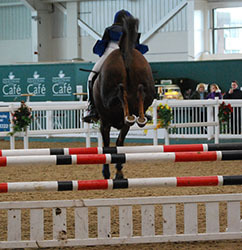 The striking coloured Pearl Prince, owned by Angel Roberts and ridden by Robyn Harris was 3rd. First placed 5 year old, Morrigan Marhaid, ridden by Robyn Harris and second placed, Talhaearn The General, ridden by Abby Harris are picture on the right. Pearl Prince is pictured further down the page. Part Bred Connemara; 148cm Grey Mare; 2005. Sire: Kilmullen Fionn (Connemara); Dam: Morrigan Lucy Too (PB Welsh); Damsire: Telynau Pavarotti (PB Welsh). Country of Birth: UK. Breeder: Morrigan Stud. Owner: Morrigan Stud. 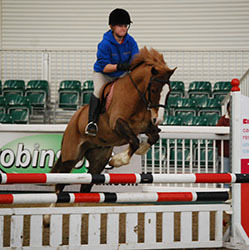 Welsh Sec D; 140cm Chestnut Gelding; 2005. Sire: Thorneyside The Governor (Welsh Sec D); Dam: Talhaearn Hevlwen (Welsh Sec D); Damsire: Talhaearn Orient Express (Welsh Sec D). Country of Birth: UK. Breeder: E A Davies. Owner: E A Davies. 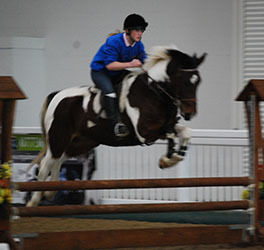 148cm Tobiano Gelding; 2005. Sire: Not supplied; Dam: Not supplied; Damsire: Not supplied. Country of Birth: Not supplied. Breeder: Not supplied. Owner: Angela Roberts. 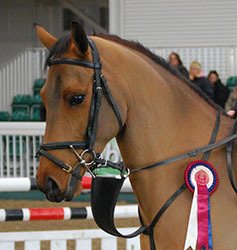 Part Bred Welsh; 138cm Liver Chestnut Mare; 22-May-2004. Sire: Brockwell Victor (PB Welsh); Dam: PHS Dafiinah Alarabi (Arab); Damsire: So-Black Alarbi (Arab). Country of Birth: UK. Breeder: Sonia Whittington-Davis. Owner: Sali Parry. Connemara; 148cm Bay Gelding; 01-May-2004. Sire: Callowfeenish Mairtin (Connemara); Dam: Cuckoo Valley Candy (Connemara); Damsire: Mervyn Kingsmill (Connemara). Country of Birth: Ireland. Breeder: Stephen Heanue. Owner: Jemma Knox. Connemara; 138cm Bay Gelding; 21-May-2004. Sire: Woodbrook Cognac (Connemara); Dam: Castlewood (Connemara); Damsire: Newbridge Oliver (Connemara). Country of Birth: Ireland. Breeder: Mrs E Medlycott. Owner: Dawn Lawton. 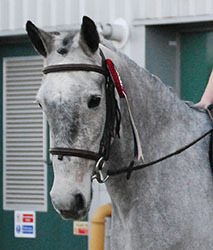 Part Bred Connemara; 140cm Grey Gelding; 2004. Sire: Kilmullen Fionn (Connemara); Dam: Morrigan Lucy Too (PB Welsh); Damsire: Telynau Pavarotti (PB Welsh). Country of Birth: UK. Breeder: Morrigan Stud. Owner: Morrigan Stud. 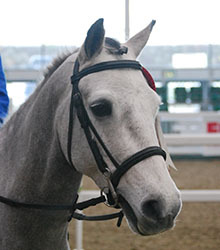 Connemara; 135cm Grey Gelding; 2004. Sire: Aillies Admiral (Connemara); Dam: Firies Jane (Connemara); Damsire: Granahan Champ (Connemara). Country of Birth: Ireland. Breeder: Eva Knightly. Owner: Jenny Gregson.